This single is a promo only release, stereo on one side, mono on the other. 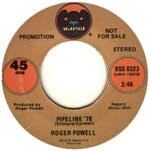 Roger Powell is a veteran of many an album, and renowned studio drummer. Why he decided to record Pipeline is a mystery, and more mysterious still is why a major label like WEA subsidiary Bearsville would release it in the punk and corporate days of the late seventies. This is a fine single. The concept is postmodern surf. There is little resemblance to the original Chantays recording, except of course in the melody. The drums are the thing, and they are heavily processed electronic whizbangs with loads of phasing and cool sounds. Nary a traditional thought was at hand the day this was cut, but as seventies surf goes, this is one dandy little gem.